The parent company of SkyKem started in the early 1920’s when a London businessman and amateur chemist, Ephraim Louis Jackson, invented a practical system of chemical sanitation that could be used in the home. His work proved highly successful and in 1924 he started a business to concentrate on these new products. Taking his initials, and the first three letters of sanitation he called his business ELSAN. Over this time aviation also developed rapidly and companies such as Handley Page and de Havilland focused on the development of intercontinental aircraft capable of carrying passengers across the globe. From this time, Elsan began supplying aircraft manufacturers with special light-weight toilets and this demand for both toilets and chemicals continued through to the 1950’s. 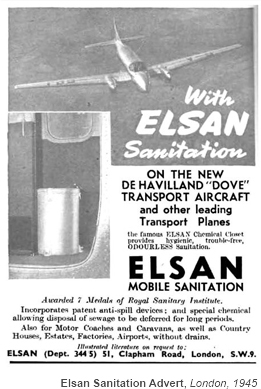 But as aircraft became more sophisticated airframe manufactures began to design custom fitted toilets and Elsan’s role was now to provide the chemicals that prevented bad odours and prevented disease. From the R100 airship to B.A.’s Concorde fleet, our products have always been at the forefront of technology. Today, SkyKem manufacture a full range of special products for use in supporting your toilet and water facilities. These include high performance, low tar deodorants for toilets and a unique, chlorine free, purifier for your potable water. We continue to invest in product innovation in order to meet our objective of providing the best possible products so you can offer unbeatable standards of hygiene. And we look forward to another 80 years of service.